A license key will be sent to your email, upon purchase of the premium add-on. If you've lost that email, please visit the Restore Purchase page and follow instructions to recover your information. Activation of the license key is required for automatic updates. Press Save Changes button to activate license key. You can clear the License key field and click Save Changes to deactivate license key later. The following errors may occur upon activation of a license key. This error may occur on local development environments. If you're trying to activate a license key on local site, for example WordPress.wp or mywp.develop, you'll get this error. However, you can activate license key on the following local domains: *.dev, *.local, localhost. If you're using other domain name for local site, you can still activate license key manually. Follow this guide to do that. This error may also occur if you're trying to activate invalid license key. Please make sure that you aren't missed some part of license key when copied it from email. License key should have the following format: XXXX-XXXX-XXXX-XXXX (four groups of four digits/letters, separated by hyphens). If you've purchased a license key with a limit on the number of websites (Single Site or 2-5 Sites options), you could only activate it on the specified number of websites. This error indicates that your license key has reached its activation limit. You should deactivate this license key on other websites to be able to use it again. Just clear License key field on any previous site to deactivate license key on that site. If you do not remember at which site(s) you have activated license key, please contact support. Each license key is intended for use with a specific add-on. 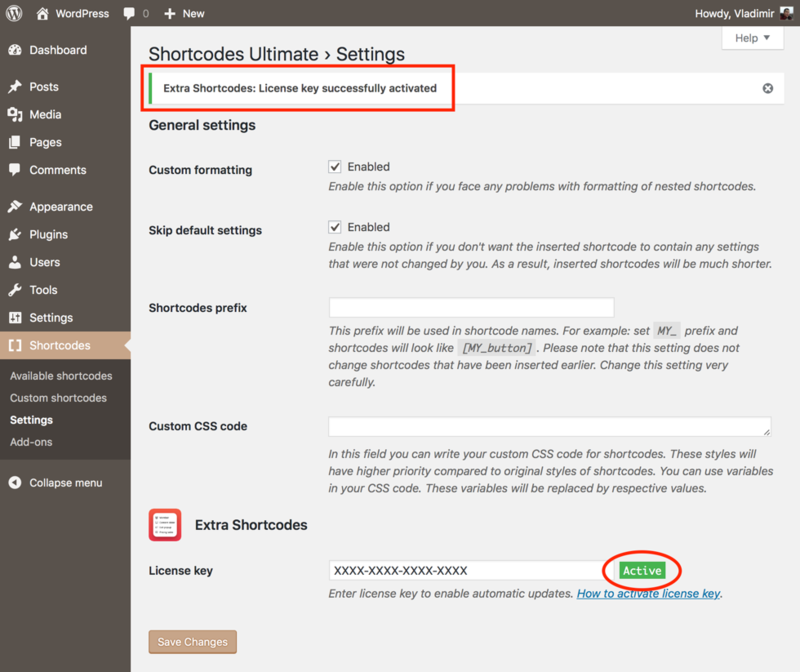 It means you can not activate Extra Shortcodes add-on (example) using license key of Shortcode Creator add-on (example). If you are feeling confused about purchased license keys, please contact support. If you've faced this error, it's most probably that your site unable to connect to the activation server. In this case, you'll need to activate your license key manually. This article will guide you through manual license key activation. This error should never happen. If you've faced it, please contact support immediately. On multisite installations, license key could be added only on the main site. A plugin should be updated only on the main site too. You can activate a license key on the following local domains: *.dev, *.local, localhost. Activation on local domain won't be counted. If you're using another domain name for a local site, you can still activate license key manually. Follow this guide to do that. Feel free to contact us, If something went wrong.